A Louisiana school wins the right to mix Church with State. Fox News is ecstatic over the practice of American Shari'a Law. "No nation can be strong except in the strength of God, or safe except in His defense. The trust of our people in God should be declared on our national coins." The mint could not make the changes without an act of Congress, so in December of 1864 an act of legislation was passed that approved a change in composition of the one-cent coin as well as authorized the minting of a two-cent coin. Secretary Chase had approved mottoes that read IN GOD WE TRUST, which then first appeared on the 1864 two-cent coin. Subsequently, in 1865 Congress passed a law to make it appear on gold and silver coins as well. It wasn't until 1957 that the motto appeared on our paper currency. Emboldened by the rapidity with which the Congress embraced the use of the "In God We Trust" motto on paper money, Congressional forces still energized by rampant McCarthyism and anti-Communism thought it the opportune time to make the "In God We Trust" motto the "national motto." Both Fox and Friends and Outnumbered featured a story about a Louisiana middle school which dueled with the ACLU over the motto, which festooned the marquee in front of the school. Of course, the battle was won by the god-fearing students in this reddest of states. This delighted Foxlets Stacey Dash, Andrea Tantaros and Elisabeth Hasselbeck the most. Tantaros proclaimed that Liberals won't be happy until religious people are forced to practice in their basements. Students at a Louisiana middle school rallied en masse after administrators decided to remove the words "In God We Trust" from the marquee outside the school. Joey Ketchum, a pastor and a coach at the Shreveport school, explained on "Fox and Friends" today that the marquee went back up on Friday afternoon. The phrase had been removed following a legal dispute between the ACLU and another school in Caddo Parish. The complaint by the ACLU led to all public schools in the district removing religious references. What's omitted by Fox News is the fact that IN GOD WE TRUST superseded E Pluribus Unum during the McCarthy witch-hunt era. That was the same time the non-secular "Under God" was added to the Pledge of Allegiance. 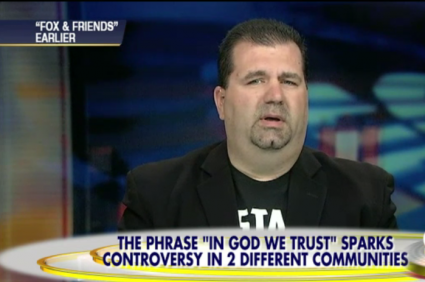 If Fox News really cared about "freedom," they wouldn't be praising the unification of Church and State. The framers of the Constitution, the document they claim Democrats loathe, wanted to maintain the two pillars as separate entities. In countries the Fox "News" viewers are taught to fear and hate, that very same principle is called Shari'a Law. However, the fact that most of these folks leading the charge to end secular public schools are white and Christian, they can't see the similarity. "If it's good for our money, it's gotta be good for the sign," said Ketchum, calling it "wonderful" to see the students' voices heard. Perhaps if that phrase were one day replaced with a saying from the Quran, the reaction to this news would be quite different.